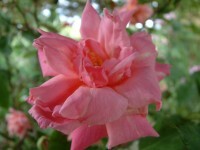 Old Tea Rose. We believe our stock to be from the original, ex Sangerhausen. Large double flowers, pale yellow to cream, tinged with pink. Upright growth. Tall.